One of my many character flaws is that I love the Hermès Hermèssence collection. I live for sheer, ephemeral things that are basically non-existent. According to online perfume platforms and other perfume-related reviews, this is a problem. But, it’s not for me. I think things that last forever on the skin are a nightmare; they’re oppressive. My attention span and patience aren’t equipped for marathon perfumes. 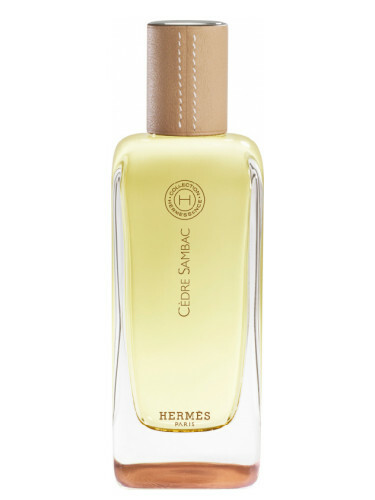 This year Hermès has launched additional perfumes in the Hermèssence collection. The names suggested “heavier” perfumes, but I’m a true fan girl. I knew these wouldn’t be, so I couldn’t wait to try them. I like the idea of seeing Hermès tackle traditionally “heavy” notes or a style of perfumery but make it their own (cohesive with the rest of the line-up). Cèdre Sambac may not be the best name for this fragrance. I think most of us that have worn it will agree. To me, it’s a sandalwood and sheer, cool and silky jasmine. The jasmine is sheer, inky and mineral. I also get something that is like button mushrooms and white florals, so it makes me think of gardenia. As it wears, it becomes a dry sandalwood, like sandalwood shavings, and the white florals become more abstract. I’m reminded of jasmine and a creamy tuberose. Overall, Cedre Sambac is a sheer, creamy white floral with woods. It reminds me of living gardenia on a tree and natural, unlit Japanese incense (sandalwood). But, it’s texture is like silk, so I imagine a floral gardenia print on silk. Cedre Sambac was love at first sniff for me. The more I wear it, the more I love it. I think its first impression is a “pretty white floral with woods”, but the more time I spend with it, the more I pick up on nuances like the mineral/ink and mushrooms. This makes me love it even more. It’s gorgeous but it has some subversive notes that (frankly) make it art. Give Cèdre Sambac a try if you like the thought of an airy, woodsy white floral. I also think it’s worth trying if you are looking for a gardenia that is still on the tree or even if you want a really good sandalwood. I think projection and longevity are average, actually above average in comparison to others in the line. It’s something that I forget I’m wearing but hours later in the day someone is always like “What are you wearing? You smell so good”. Yes, the Hermès and I will take credit for that. The 3.4 oz bottle retails for $260 at Hermès. Travel sizes are also available. Victoria’s Final EauPINION – Creamy gardenia and sandalwood…but make it Hermèssence. I hate to say this because even though liking this line is my character flaw, I can also admit that they seem to be really overpriced, but I want a small bottle of this. It’s easy-to-wear and it smells good. Plus, I’m always looking for a gardenia that doesn’t smell like a public restroom. *Sample obtained by me. Product pic from the brand. Pat Cleveland pic from shrimptoncouture.com. This sounds gorgeous. Of course, we’re exact opposites when it comes to what we like in longevity and projection: I’m always looking for something that will stay put on me instead of vanishing from my dry skin! But with the notes you just described, I may have to give this a try . . .
I’d be curious to see what you think of this and how it wears. It lasts longer on me than the others from the line but I don’t know if I’m being partial because I like it so much. I am right there with you on this fragrance. It was love at first sniff for me also. Yay! Glad to know I’m not the only one! For the first time in my life, the Hermes sales associate was generous with samples. I’m treasuring the ones I have but after that, I’m getting a travel spray. I love it.